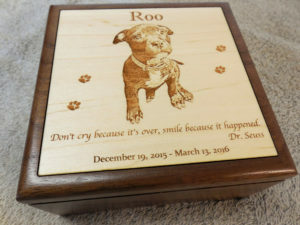 Here are a few pet urn memorial sayings that you may find useful or inspiring. 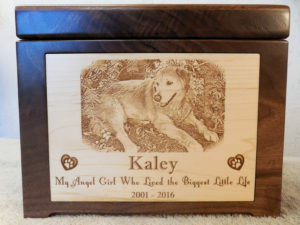 Sentimental pet loss sentiments to give you some ideas for personalized inscriptions for your laser engraved wooden pet urn from Laser Designs Engraving. 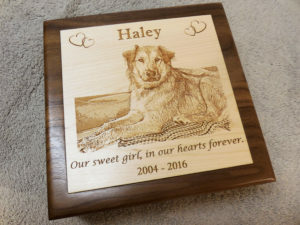 You can see my selection of wood engraved pet urns by clicking here. How Precious the Time, How Beautiful the Memories. Forever Loved. If tears could build a stairway and memories a lane, I would walk right up to heaven and bring you back again. Until One Has Loved a Dog, a Part of One’s Soul Remains Unawakened. You’ve left our lives, but you’ll never leave our hearts. When I am gone, release me, let me go- I have so many things to see and do. You must not tie yourself to me with tears, be happy that we had so many years. I gave you my love; you can only guess how much you gave me in happiness. I thank you for the love you have each shown. But now it is time I traveled alone.